Psychiatrists at an Illinois youth prison have prescribed a powerful antipsychotic medication with a high potential for abuse to hundreds of juveniles in custody who have disorders for which the drug has not been approved, according to a new report. The drug quetiapine, sold under the brand name Seroquel, is an antipsychotic medication that was designed to treat severe psychiatric disorders such as schizophrenia and bipolar disorder. But the drug has been prescribed at the Illinois Youth Center in downstate Harrisburg to kids diagnosed with conduct disorder and attention deficit hyperactivity disorder, conditions for which the drug has not been approved by the Food and Drug Administration, according to a prison watchdog group. The John Howard Association began asking questions about prescriptions for psychotropic medications when it visited the Harrisburg prison in May and noticed kids sleeping in their cells in the middle of the day, Vollen-Katz said. Seroquel can have a powerful sedative effect and administrators at the Illinois Department of Juvenile Justice implied in their response to the report that it was being used at Harrisburg as a sleep aid. In a report on the Illinois youth prison in Harrisburg, the prison watchdog group expressed concerns about prescriptions of Seroquel for youth with conduct disorder. Seroquel is not approved by the FDA as a treatment for insomnia, said Dr. Michael Naylor, a child and adolescent psychiatrist at the University of Illinois at Chicago and director of the university’s Behavioral Health and Welfare Program. Most psychiatrists would not prescribe Seroquel for sleep issues for two reasons, he said: its serious physical side effects and strong potential for abuse. “Seroquel is actually referred to as ‘the jailhouse heroin,’ because it gives a sort of feeling of well-being and a woozy high,” Dr. Naylor said. It has been used as a recreational drug with the street names “Suzie-Q,” “Quell,” and “Squirrel,” he said, and abuse of the drug has been documented in correctional settings. A 2004 letter in the American Journal of Psychiatry estimated that 30 percent of inmates in the Los Angeles County Jail were faking psychiatric symptoms in order to get Seroquel prescribed. “The concern I have is, is there an underground economy of drugs of abuse going back and forth between kids?” Dr. Naylor said. 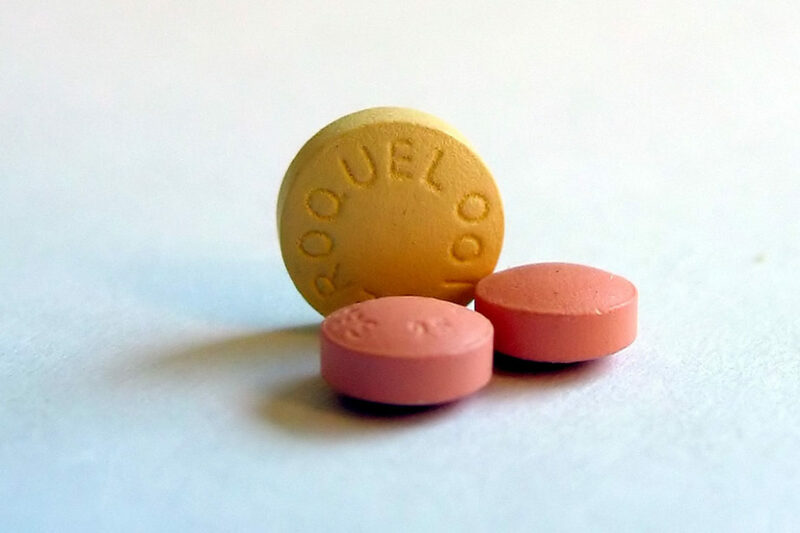 One of Seroquel’s side effects is that it can cause significant weight gain and contribute to the development of Type 2 diabetes, Dr. Naylor said. Black and Latino kids, who are disproportionately represented in Illinois’ youth prisons, are already at increased risk for diabetes compared to their white peers. “The fact that we’re putting kids at risk for other medical issues, that’s hugely concerning,” Vollen-Katz said. AstraZeneca, the pharmaceutical giant that makes Seroquel,has been scrutinized for years for promoting the drug for “off-label” uses, including the treatment of aggression, ADHD, anxiety, and sleeplessness. The drugmaker settled with the federal government for $520 million in 2010 after the U.S. Department of Justice found it had illegally marketed Seroquel for non-FDA-approved uses, particularly targeting psychiatrists in “long-term care facilities and prisons,” according to a DOJ release. Do you or someone you know have experience in the Illinois juvenile justice system? We want to hear from you. Contact reporter Jonah Newman. IDJJ did not respond to the Reporter’s specific questions about prescriptions of Seroquel, its side effects, or its potential for abuse. In a statement, a spokeswoman said the department “is committed to providing youth the mental health services they need, including counseling, therapy, and in some cases medication.” She said IDJJ hired a child and adolescent psychiatrist in 2017 to oversee psychiatric services at all of the department’s facilities. “She, along with two additional child and adolescent psychiatrists, are reviewing youth diagnoses and prescriptions to ensure they meet best practices,” the spokeswoman wrote. 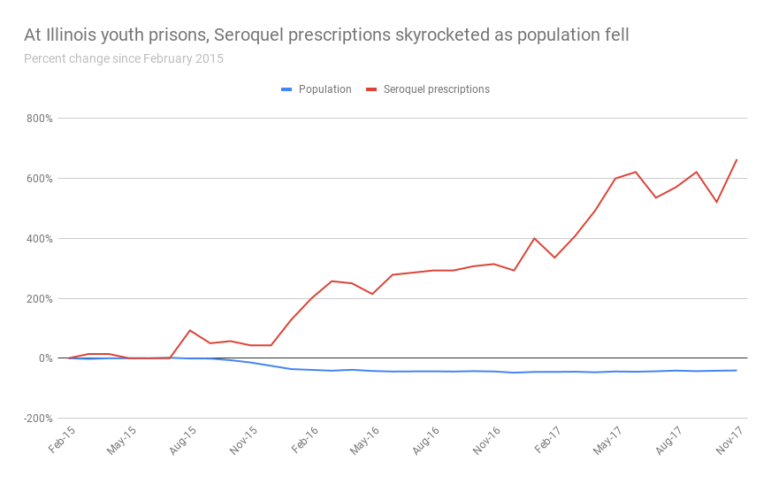 Seroquel was by far the most commonly prescribed drug across Illinois’ youth prisons system last year, and its use has risen sharply in recent years, according to data obtained by the Chicago Reporter last December. From February 2015 to November 2017, prescriptions of Seroquel in Illinois’ juvenile prisons rose from 14 per month to 107, a six-fold increase. At the same time, the monthly population of the youth prison system dropped by 40 percent, from 700 to 416. That means last November there was one Seroquel prescription for every four incarcerated youth. At IYC-Harrisburg, the rate was even higher: one Seroquel prescription for every two-and-a-half youth. Harrisburg, the second-largest of five youth prisons in the state, is an isolated, medium-security facility about 30 miles from the Kentucky border. It was the subject of a state legislative hearing last year after advocates found that guards were filing adult criminal charges against youth at the facility, in some cases for relatively minor brush-ups. Eighty percent of the youth there have some sort of mental health needs, according to the John Howard report, but the vast majority were classified as having minor mental health needs. The most common diagnoses were conduct disorder, attention deficit hyperactivity disorder, and depressive disorder, all conditions for which Seroquel is not FDA-approved. But that doesn’t mean that Seroquel and other antipsychotics can’t be effective at treating some of the symptoms of conduct disorder, said Dr. John Walkup, chair of the psychiatry department at Lurie Children’s Hospital in Chicago. He acknowledged that best practices are to try non-pharmaceutical therapy first, and only to prescribe medication if those alternatives are determined to be ineffective. But without knowing each juvenile’s medical and diagnosis history, it’s impossible to know for certain if Seroquel is being over- or mis-prescribed. “Without being able to link medication to diagnoses or, more accurately, to problem sets, you don’t really know what the medication is being used for or if it’s being used appropriately,” he said. Illinois Gov. Bruce Rauner and the Movement for Black Lives have a common interest in taking bold action to change drug policies.